Not an incredibly huge issue, but is there a way to change the ads that are showing for the tolzar gems, etc? The last couple days I’ve been getting this raunchy casino vampire ad...I think it’s called scatter slots? Not to sound like a prude old woman, but it’s a little too explicit for my taste (especially in something as innocent as dragonvale) and would prefer not so see it. Hopefully none of your kids are having to watch this ad! The ads are somewhat targeted, and I find it interesting to see how each of my different devices gets different types of ads in Dragonvale. I have one device that only gives me news stories on sports or medicine, and it's super annoying in that there's no video that plays, you must click 'next' after 15 seconds or so or it just sits there, and then wait another 15+ seconds for the 'finish' button. No starting the ad and putting it down until you stop seeing movement on the screen. I have another device that shows me specific games related to games I've downloaded there. And then on my main ipad, I used to only get a different set of game ads but I'm now also getting the one you mentioned plus several other gambling games. I figured it was because I was googling Vegas things recent for an upcoming trip this summer. On a similar topic, I've been thinking a little more on why Backflip would remove our ability to get free stuff from ads when most of us pay them real money. We've been looking at it like they're punishing us, which really makes no sense, but I wonder if they're somehow looking at it as a perk. A lot of games have options where you can purchase no ads, as ads are rather annoying. But the big difference there is that all of these games leave in the options to watch things for your bonuses but when you click them, you just get the reward without any ad playing. Maybe they're removing the ads are a free bonus for players who make purchases, without thinking through the fact that they need to leave in the Tolzar, Colosseum, and Market options and just have them reward you instead of playing an ad for the next 6 weeks. That would actually make more sense, and it would probably lead me to spending 5+ every month or two again. So they're taking them out and thinking they don't want to put them back just cause some of us are complaining, as they think it's a bonus for some. Maybe we need to start asking for them to return with the bonuses, but not play ads - maybe that will get more support. Otherwise it just seems so crazy. I got that ad and couldn’t believe it would show up in DV. When it showed up a second time, I recognized it at the opening screen and immediately closed DV and reopened it. Tolzar let me try again and the ad hasn’t been back....yet anyway. A few days later I got a “survey” for directing ads towards my interests. The survey asks for personal information that I don’t feel like providing. So I closed that too. The raunchy ad still hasn’t come back. Maybe it’s a coincidence, maybe not. I was just thinking about this and came to the same conclusion: most games build ads in as a necessary evil that players have to get through if they don't want to pay to unlock content or progress to the next level. Some players who can't stand the presence of ads in these games would rather pay to remove them for a more immersive experience. In DragonVale ads are completely optional, and you can definitely play it without seeing a single ad. 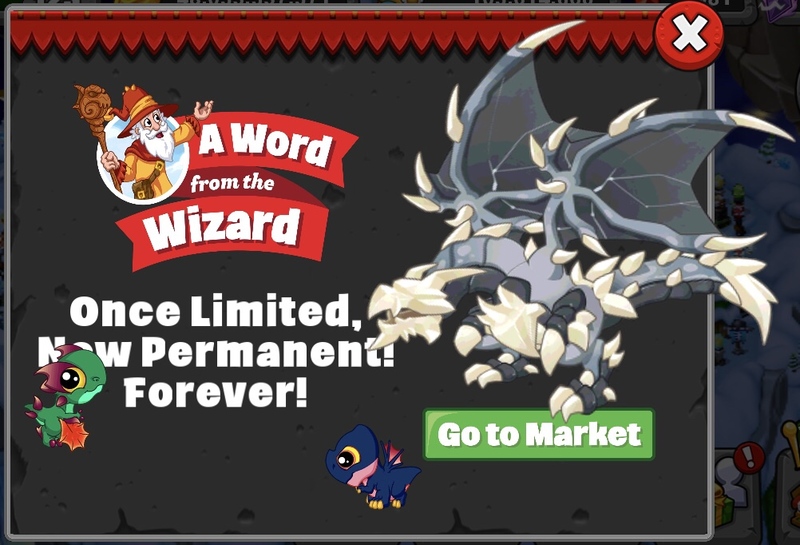 Personally, I think that ads in DragonVale break the immersion; BFS tries to present them as "visions" but it's clear they're there to help make extra money. I agree that they do need to give us the rewards that we lose out with the removal of ads, so maybe they could tweak Tolzar to give us these rewards daily. A timer showing how long these ad-free rewards last might be helpful too! It'll definitely make the ad model more obvious to players, but I think it would be a fairer way to go about things. There have been several really bad ads on some of our games. In my opinion only ads similar in rating to the type of game should pop up. I keep getting this nasty one, a sniper one that shows a head shot, and a mystery one that shows a bloody body in the tub. None of these are appropriate for a game that children play. I looked for a report button, but I didn’t see one. Trying to decide if I hatch an Cyclamen egg or make it a pedestal. I only have one of the dragons. Hatching would give me two. It’s currently unavailable. If I have two, would I still have a chance to breed another one, even though it’s unavailable? 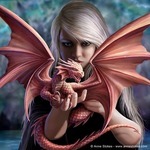 You can clone this dragon by breeding it with one or two as parents. It might take a bunch of tries, but other than the evolved dragons you can clone anything else with just one parent. Usually the odds are higher if you have two. Thanks to the mystery egg today (a Wrath), I finally have a fire-breathing Dragonarium again... time for more dragons that are impossible to breed I guess. I sent BFS an email about the raunchy casino ad, being unsuitable for children, I heard nothing back, sad state of affairs. I got a screen Friday saying that Auroch, Chimneypuff, and Chitin are no longer limited and now permanent forever. The latest dragons from Gardenia’s event are now the only golden hybrids that are still limited. Plenty of players, myself included, specifically requested Brilliant and Fever be permanent, as the game initially labelled them. Maybe we are now on the way. Fanfare and parades await. Ooooh only about 15 twins to go for blue fire! So close yet so far... A twin weekend is much needed to get there as the chances of getting one of these 15 left from a mystery egg is very low. @steelbluminati, curious whats your status with bluefire right now? Happy to report my daily login reward egg was a Ghostly Decay I was missing. Then I bred the Ghostly Coal I needed. Now I just need to nail down a Silverline, and I’m good! Congrats and Koala for the rest! I had blue fire ONE time. I am 13 away right now. Ah totally forgot you're in the running for blue fire too. And Thanks! Its been a goal of mine ever since we got the rift/mystery eggs. Don't know how Steelbluminati managed to get it before the mystery eggs were introduced, pretty amazing. Its just that they keep releasing so many dragons, hard to keep up with twin versions. New app version in the ios store, just stating that it did some bug fixes. I think I saw someone else comment on this earlier, but I just realized that my Dragonarium is breathing fire, even though I don't have Fever or Brilliant. Doesn't make any sense to me. And this is even after their "bug fixes" update. I'm assuming it must be a bug, unless they have secretly decided to change the conditions under which your Dragonarium breathes fire. While we're talking about Dragonarium fire, I'm very impressed (perplexed by 😉 ) anyone who is even attempting to get blue fire. I guess I don't have the patience or inclination to do it myself. I keep twins when I get them, but have never made it a priority to get them. But that's the beauty of this game - you can play it any way you want. Rock on with your bad selves! Brilliant and Fever probably aren’t registering with the Dragonarium because they don’t belong to a subcategory (Derecho, Silverline, and Smoulderbrush are also subcategory-less). They’re only listed under the general 'All' section, but are missing from a special category, like 'Celebration'. So I sent Backflip an email about a pedestal that lost it's rift twin version at some point, probably moving it long ago through storage. It's one of those that normally doesn't have a twin version and I got it from one of the early daily login eggs before they changed it. They looked into it, went back into my history and checked the pedestals, tested out moving one today with a storage tower (doesn't do it today), and sent me the egg back. I know we give them a lot of grief at times, for cash grabbing changes, for the stupid rules on visions for paying players, etc, but Mike at Backflip is one of the best customer support people I've dealt with in pretty much any area. I've had multiple issues over the years, and this is the type of response I always get. I want to send them money and buy a gem bundle in support. But I want my visions, so I just sent a thank you instead. Anyone having trouble loading DV since the update? Backflip: "Hey you, wanna buy gems and support the game"
You: Sure why not! Here's my payment. Backflip: "Here's your gems! oh and as a bonus we're gonna take away your free ones cause you obviously don't need them"
Sounds like you were right, Adlerist. 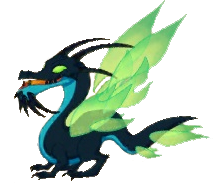 Brilliant, Derecho and Smoulderbrush are now available as permanent dragons. (Yay!) And my Dragonarium is no longer breathing fire. Hopefully Silverline and Fever will be soon to follow. Looking forward to getting my two remaining holdouts using the regular caves and not just relying on the Coop cave, which has been woefully inadequate in trying to get my last two golden hybrids.